Kota relaxing in the grass and enjoying life! Kota relaxing in the grass! 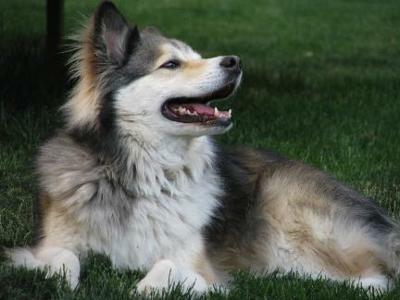 Kota is an 8 year old Alaskan Malamute who LOVES to hang out in the backyard! Kota loves to walk through our garden everyday; he will start at one end and go down the row, smelling each fragrance as he lightly steps in the grass. After "smelling the flowers" he takes up his usual spot next to our deck, puts his head up and allows the breeze to run through his fur. Every night I have to urge him to come in with some hot dogs, because I can't get him in if I don't! If we let him stay outside, he would; 365 days a year, 24 hours a day, 7 days a week! Kota became part of our family when my mother and I were volunteering at a dog adoption. We were supposed to be showing him to people but we fell in love with him. We took him home that night and my father fell in love with him too, so the next day when we brought him back, we said, "Where do we sign?" And that was 5 years ago and we love him more today, than the day we brought him home! Kota is a wonderful dog, and my family can't imagine life without him! Comments for Kota relaxing in the grass and enjoying life! I would like to say that you have done a great work. I would also like to say that keep moving forward and keep working harder. Kota looks really nice and very happy because kota enjoying life and very happy. I would like to say that such a good post. I was looking for good ideas about garden design and landscaping. I am so happy that I found your blog. It is awesome. I like it very much. This is a beautiful dog! He looks like he's really enjoying himself. I like that your dog goes up and down the row smelling the flowers! That's so sweet! I think your dog is beautiful. This is a wonderful picture of a dog in the garden. I can really see that he is enjoying himself as he sniffs the air. He is Beautiful! It looks like he's having a wonderful time!